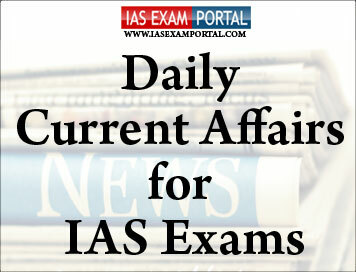 Current Affairs for IAS Exams - 13 October 2018 | IAS EXAM PORTAL - India's Largest Community for UPSC Exam Aspirants. The government will set up a committee of judges and lawyers to examine the existing legal and institutional framework to deal with complaints of sexual harassment at the workplace, Minister for Women and Child Development Maneka Gandhi announced on Friday. The decision comes even as the government is yet to make a statement on allegations by several women journalists against Minister of State for External Affairs M.J. Akbar. The Minister said the expert committee will advise the Ministry to strengthen the existing framework. A Ministry spokesperson said a formal order on the constitution of the panel is expected in a day or two. “The Prime Minister has always given top priority to the rights of women. The first programme that he launched was Beti Bachao, Beti Padhao. We don't save our daughters to allow big shots insult them later in life,” the Minister said. “While there is an urgent need to put the redressal mechanisms in place at every workplace, it is equally important that survivors and complainants are actively supported in their quest for justice,” the statement said. The Ministry of Housing and Urban Affairs has notified the modified land policy. The policy would be applicable in the urbanizable areas of urban extensions in 95 villages of Delhi. The policy replaces the earlier policy notified in the year 2013. It aims at developing smart and sustainable neighborhoods, sectors and zones, planned and executed as per the availability of water, power and other infrastructure. The core of the policy is active role of private sector and farmers also involved in assembling land and developing physical and social infrastructure. Owners or group of owners can pool land parcels for development as per prescribed norms. Land Parcels of any size can participate under the policy. However, the minimum land to be pooled is 2 hectares to ensure adequate return of land for development and form a Developer Entity. For smooth planning and development of infrastructure, integrated Sector-based planning approach shall be followed. A minimum of 70% contiguous land of the developable area within a sector, free of encumbrances is required to be pooled to make the sectors eligible for development under the Policy. To keep pace with new forms of development, provision for achieving a vertical mix of uses (residential, commercial, public and semi-public) at building level is introduced. Additional Development Controls have been introduced to regulate building and infrastructure aspects of developments. Consumer price inflation accelerated marginally in September to 3.77%, from 3.69% in August. Inflation in the food and beverages segment quickened to 1.08% from 0.78% over the same period, according to official data released on Friday. The clothing and footwear segment saw inflation slowing to 4.64% from 4.88% over the same period. Similarly, inflation in the housing segment slowed to 7.07% in September from 7.59% in August. Industrial production slowed to a 10-month low of 4.3% in August, due in large part to a drastic deceleration in the manufacturing, mining, and consumer durables sectors, the data showed. The starkest slowdown, however, was in the consumer durables sector, which saw growth come down to 5.2% in August from 14.36% in the previous month. The New Industrial Policy framed by the Ministry of Commerce in consultation with all Ministries of Government of India, State Governments, Industry and all stakeholders embodies the Government’s intention to align India with the emerging technologies of drones, artificial intelligence and block chain. This was stated by the Union Minister of Commerce & Industry and Civil Aviation, Suresh Prabhu, at the launch of the Centre for the Fourth Industrial Revolution, India, by the Geneva-based World Economic Forum (WEF) yesterday in New Delhi. The Minister further said that the policy is in sync with the challenges and opportunities for India with the fourth industrial revolution technologies and will place the country firmly in the global supply and value chains. Suresh Prabhu went on to state that the fourth Industrial revolution is driven by digital technology and India is on track to adopt digital technology in every aspect of governance. This will help the country to leap frog into the global supply chain. Minister gave the example of the recently launched Digi yatra by the Ministry of Civil Aviation as an example of India’s vision to transform the country into a digitally empowered society. The WEF is setting up a Centre for the Fourth Industrial Revolution in Maharashtra. The other centres are in San Francisco, USA, Japan and China. Artificial intelligence, block chain and drones are the first three projects of the centre in India. WEF will work in collaboration with the NITI Aayog, business leaders, academia and start-ups in these projects. Terrorism is an overwhelming threat to the international order and countries should cooperate with each other in dealing with this threat, External Affairs Minister Sushma Swaraj said in her statement at the Shanghai Cooperation Organisation (SCO) ministerial meeting in Tajikistan. Dwelling on the Indian point of view on regional affairs, the Minister said India would like to host the next round of SCO-Afghanistan discussions. “Terrorism remains the most overwhelming threat to our common goals of development and prosperity. As the footprint of terrorism expands, governments must assume their national responsibility and cooperate with each other,” Ms. Swaraj said in Dushanbe on Friday. During the meeting, the Minister also met Chief Executive of Afghanistan Abdullah Abdullah. India extended support for the “Afghan-led, Afghan-owned and Afghan-controlled” peace process. “In this context, we welcome the signing of the Protocol of the SCO-Afghanistan Contact Group on the sidelines of the Qingdao Summit,” Ms. Swaraj said. The 5th meeting of India-Azerbaijan Inter-Governmental Commission on Trade and Economic, Science and Technology Cooperation (IA-IGC) was held on 11-12 October, 2018 in New Delhi. The two sides exchanged views on current economic situation and reviewed the current status of bilateral trade, investment and their cooperation in the fields of trade, economy, science and technology. It was decided to send trade delegations to raise awareness regarding economic developments and reforms in the two countries and have regular exchange of information about trade exhibitions, fairs, conferences and other business events. Both sides agreed to convene the next meeting of the India-Azerbaijan Inter-Governmental Commission on Trade, Economic, Science and Technology co-operation in Baku. The dates for the meeting will be mutually agreed through diplomatic channels. India is planning a major mission to sequence the genes of a “large” group of Indians — akin to projects in the U.K., China, Japan and Australia — and use this to improve health and buck a global trend of designing “personalised medicine”. This was among the key decisions taken by the Prime Minister’s Science, Technology and Innovation Advisory Council (STIAC) at its first meeting on Tuesday. Ever since the Council of Scientific and Industrial Research in 2009 announced that it had sequenced the genome of an Indian, then making India one of six countries to achieve such a feat, several research labs have analysed genes from Indians for disease susceptibility. However, no compendium of genes that differentiate Indian populations from, say, Caucasian or African genomes exist. A group of Indian scientists and companies are involved with a 100k GenomeAsia project, led by the National Technological University (NTU), Singapore, to sequence the whole genomes of 100,000 Asians, including 50,000 Indians. The Council acts as a coordinator between several Ministries to work on projects and missions and is scheduled to meet once a month, he said. Gold medals in athletics, chess and badminton ensured India continued its impressive performance at the Asian Para Games on Friday. K. Jennitha Anto clinched the gold in women’s individual rapid P1 chess event after beating Manurung Roslinda of Indonesia 1-0 in the final round, while Kishan Gangolli got the better of Majid Bagheri in the men’s individual rapid VI-B2/B3 event to claim the top spot. In para-badminton, Parul Parmar notched up a 21-9, 21-5 victory over Wandee Kamtam of Thailand to win the women’s singles SL3 event.